Former Federal Reserve Chairman Paul Volcker is on the shortlist for the US secretary of the treasury position in the Obama administration, Ynet has learned. Should Volcker, 82, be passed for the position, he is likely to be named head of the US Financial Council. Volcker, who chaired the Federal Reserve for eight years, was appointed head of the committee which probed the liability of Swiss banks to holocaust victims, in 1995. The committee's effort yielded $1.5 billion in restitutions to Holocaust survivors. While spearheaded by Volcker, the committee met once a moth, usually in Zurich. The committee was made up of five Swiss members, representing the banks, and five Jewish members - Avraham Burg, Ron Lauder, Israel Singer, Dr. Reuven Bracha and Attorney Zvi Barak. "There is no doubt that a big part of the restitution was achieved due to Volcker's involvement," said Attorney Barak. "To this day, there is a restitution fund that's based in New York and is distributing these funds to the survivors and their heirs. "The five years Volcker spent working with an Israeli team have made him well versed in Israeli matters. Should he be named secretary of the treasury or head of the Financial Council, Israel will have a friend there," he added. Volcker headed the Federal Reserve between 1979 and 1987, under presidents Jimmy Carter and Ronald Reagan. After leaving the Fed, he went into private practice, becoming chairman of the prominent New York investment banking firm, J. Rothschild, Wolfensohn & Co.; but he was occasionally asked to head public committees – the most famous of all probed possible corruption in the Iraqi Oil for Food program, in 2004. Born to a Jewish family in New Jersey in 1927, Volcker attended Princeton University, Harvard and the London School of Economics. In January of 2008, he endorsed Barack Obama's presidency bid and was his closest financial adviser. 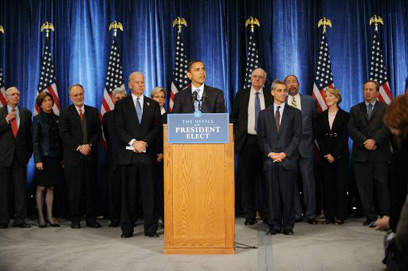 Volcker was one of the advisers responsible for wording Obama's speech calling for a comprehensive reform in the US financial regulatory system. Famed economist and Nobel Laureate Joseph Stiglitz endorsed Volcker's nomination for secretary of the treasury, saying that he possessed the knowledge necessary to restore confidence in the financial and credit markets. See all talkbacks "Obama mulls naming Jewish economist secretary of treasury "